iMessage works great for sending and receiving pseudo-text messages with your iOS-using friends. But until Apple releases a Mac OS client for iMessage, or an iOS version of iChat, there’s no Apple-provided way to exchange instant messages across popular networks like AOL Instant Messenger, Facebook, or Google Talk from your iOS devices. Were Apple to provide an IM app, however, I suspect it would look an awful lot like Verbs IM, from Include Tech. Networking It: Verbs connects with AIM, Google Talk, MobileMe, and Facebook’s IM network. 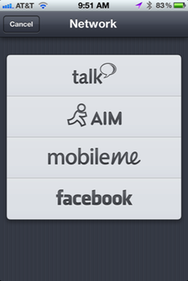 Verbs lets you connect to any number of AIM, Mobile Me, Facebook, and Google Talk accounts. Adding accounts is as simple as tapping the plus (+) icon, choosing the appropriate network, and entering in your login credentials. Given its multiplatform support, Verbs’s list of your accounts could—and should—do a better job at delineating which account links with which service. Verbs instead shows a list of several accounts that all reference my name and standard avatar; I can’t tell which belongs to which network merely by looking. Fortunately, the app allows you to manually tweak how each network is labeled. That it doesn’t do so automatically seems like an oversight. You can tap into an individual IM account, or tap the All Accounts button to see all of your buddies. What you can’t do is search for a given buddy; you can scroll through names alphabetically, but it can get annoying if you have hundreds of contacts. On the plus side, Verbs does let you mark your favorite contacts with a star: Swipe across a contact name to reveal icons to star, remove, or edit a that buddy. You can toggle your buddy list between the complete list (separated by online and offline contacts) and starred contacts only, giving you easier access to your favorite conversants. Tap a contact, and you can start typing. You won’t see when your contacts are typing, but I found that Verbs performed reliably both for sending and receiving messages. The app also lets you configure a sharing service—either CloudApp or Droplr; it then relies on your selected service for sharing photos. Multi-Talking: Verbs makes it painless to flip between multiple conversations. 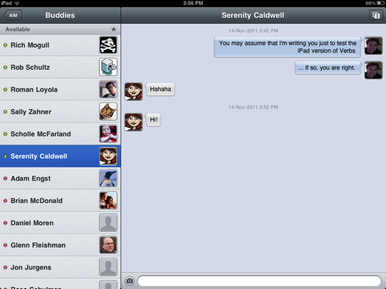 The blue dot at the bottom left indicates a conversation with unread messages. If you engage in multiple conversations simultaneously, Verbs offers a trio of ways to flip between them. You can keep navigating back to your buddies list, tapping on the names of your conversation participations—but that’s the slowest approach. The app includes a button at the upper right that shows your current number of active conversations; tap it for a scrollable view of your open conversations, one that’s very reminiscent of the approach Safari uses on the iPhone to cycle through your open webpages. (Double-tapping on the conversation window brings up the same option.) Or, you can simply swipe horizontally across your current conversation to switch to the next one. Navigating between multiple IMs is straightforward. The one missing Verbs feature that frustrated me when managing multiple conversations simultaneously was its limited notifications about new messages while you’re in the app. An optional sound dings, and the icon at the upper right glows subtly, but I’d love to get a sense of which contact IM’d me out of my current view—and perhaps what that contact said. Re-Verbs: On the iPad, Verbs is (unsurprisingly) roomier. 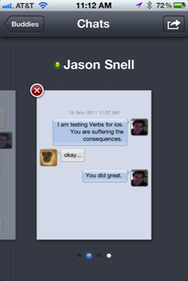 Unsurprisingly, Verbs is roomier on the iPad: You can see your buddy list and the conversation window simultaneously. On both devices, the app looks great and is easy to navigate—as I said, it’s Apple-like. But the annoyances—the lack of search, friend typing status, and better in-app notifications—grate a bit. Also annoying: I could find no obvious way to sign out from all my IM accounts at once; if I wanted Verbs to stop receiving IMs (say, because I was back at my Mac), I had to force-quit the app from my iPad’s multitasking bar. The other big missing feature in Verbs is push notifications. The app can tell you about IMs you receive when it’s not running—but only for ten minutes, only through local notifications. If you want true push notifications about received messages outside that ten-minute window, you’ll need to pony up $5 for an in-app purchase called Verbs Pro. That option lets you stay logged in for up to seven days without using the app, saves battery life by routing all of your accounts through a single network connection, and enables true push notifications. All told, Verbs is a good IM app, but not yet a great one. I’d love to see an update address the app’s missing features, because an app as lovely looking as Verbs ought to shine on the functionality side, too.